Bradshaw, R., Sherry, R., Reid, H., McGovern, Á. and Deery, S.
TestBash conferences are the most awesome, friendly and affordable global software testing conferences out there. From the first ever TestBash in 2012, we now run seven TestBashes each year all over the world. 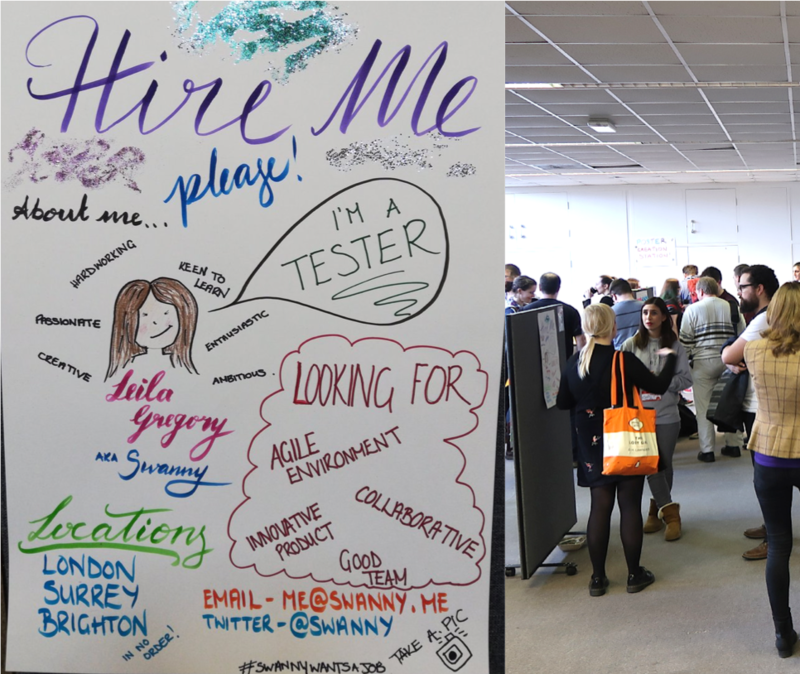 Despite this growth, each and every TestBash still has the same strong community feel due to the steadfast strong ethics and principles rooted in the foundations of MoT set by the FounderBoss, Rosie Sherry. Sherry has always placed the software testing community at the heart of everything MoT does, and TestBash is no exception. We always listen to the community and enable community members to guide our business decisions. This is exactly how The UnExpo method came to be. We received feedback from the community that they would like more engagement and structured opportunities to confer with other attendees during the breaks of TestBash. Expos are what usually take place during the breaks software testing conferences, but they don't fit in with our customer experience goals, and so the hunt for an UnExpo began. We brainstormed and researched conference engagement strategies and took inspiration from science conferences. At every fair-sized scientific conference there are scientific posters sessions (figure 1). 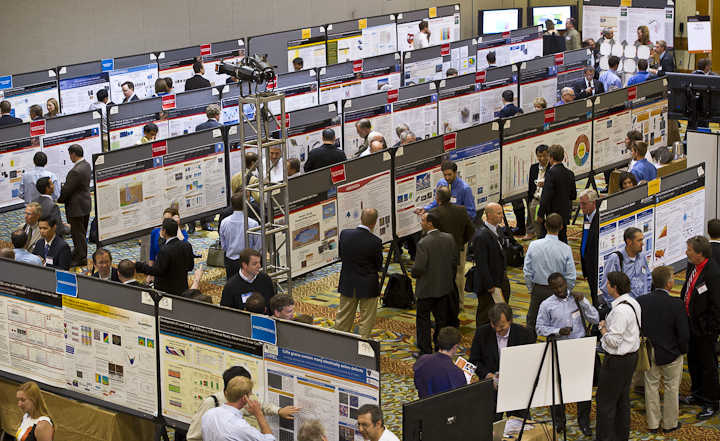 Figure 1: Scientific poster sessions - helping scientists talk science (source: Wikimedia Commons). These poster sessions offer the opportunity for scientists to share their work, practise their presentations skills and engage with other attendees interested in the same topic as themselves. The posters act as a helpful medium that make it easy for scientists to find a topic of interest and strike up a conversation with others around. Like a fair number of scientists, there are a fair number of introverts in the software testing industry. Our hypothesis: if poster sessions can engage and encourage scientists to converse, they can do the same for software testers too. However, we felt that the scientific poster session format was too rigid, passive and formal. To maximise the engagement and fun, we encouraged the software testing community to submit to run poster stands that were interactive. Posters could be on any topic attendees were currently interested in; be it technical topics or the human aspects of working in software development. Other attendees armed with post-its, pens and awesome tester brains would then walk around The UnExpo and interact with posters of interest. 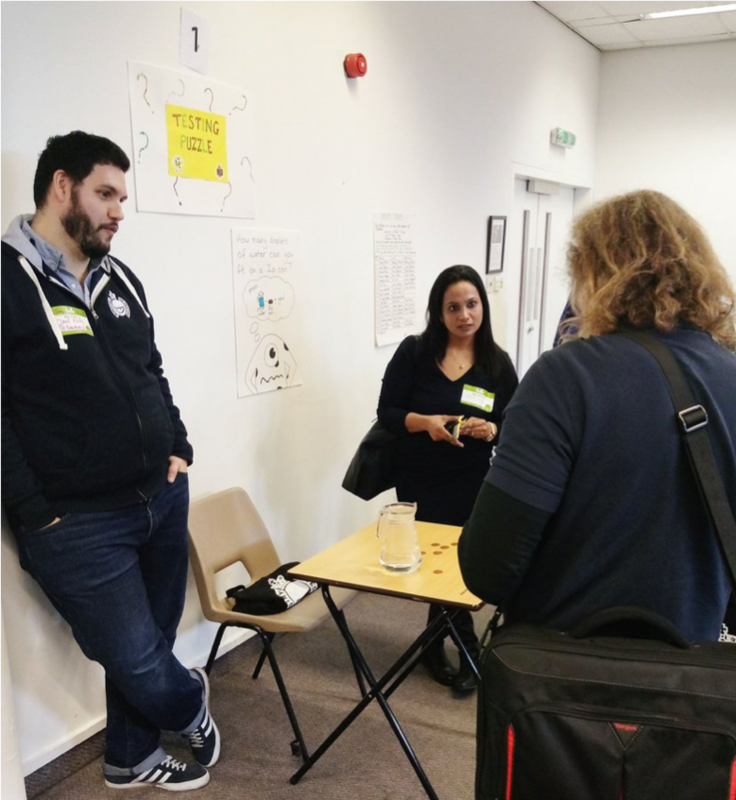 We also enabled attendees on the day of TestBash, who felt inspired by the TestBash experience, to sign up to run a stand there and then! 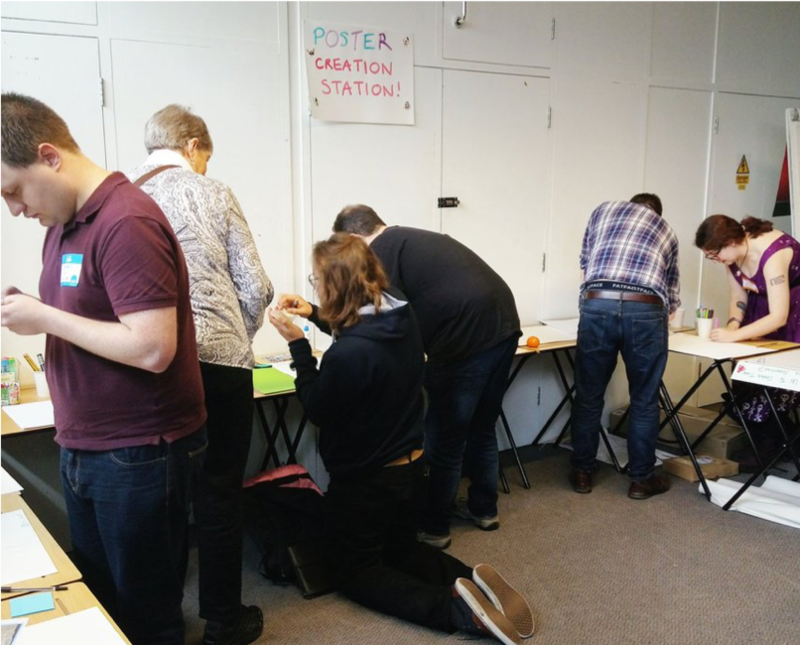 Finally, all attendees running stands were to make their posters on the day of TestBash at the poster creation station, making use of the arts and crafts available. We deemed that these poster session tweaks would lead to maximum community feels. All the Sharpies in more colours than we knew the names of. and a heap of felt! UnExpo Break Transitions: In between each UnExpo session, posters were to change to a new set of posters created by different attendees. Attendees were to make their posters during the break prior to their session at the poster creation station. Then label their work for TestBash helpers to switch posters during the TestBash talks. UnExpo Room Layout: 16 poster stands were set up in a large room, using 4 roller boards in the centre and two opposing walls (see figure 2). The Poster creation station was set up toward the back of the room allowing attendees running a stand to create their masterpieces without disrupting the flow of The UnExpo session taking place. Stands were numbered and labelled. A post-it and pen pick up point and drop off point were set up near the entrance/exit to The UnExpo. The UnExpo set off to a shaky start during the first break of TestBash Brighton; TestBashees burst through the door looking intimidated and confused. It was all new, there were signs and posters everywhere. But, where to start and what to do? 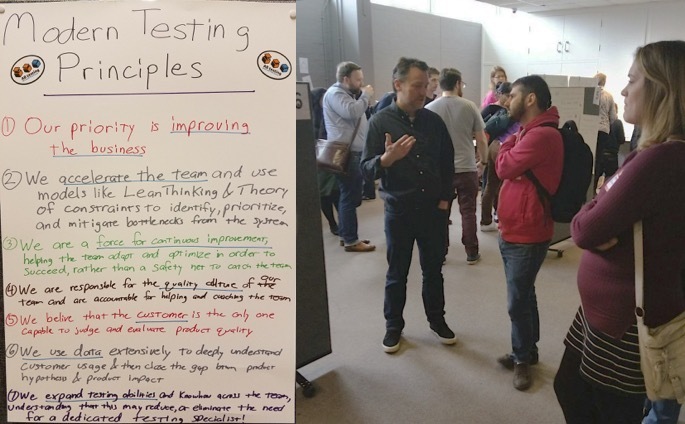 Initially, many testers huddled around the entrance and the first stand on testing puzzles by the welcoming and calming Dan Ashby (Figure 3). Figure 3: Dan Ashby being too cool for school and putting TestBash attendees at ease. That is until the immense magnetism of software testing guru Alan Page drew TestBash attendees into the back of The UnExpo to his poster on his modern testing principles (Figure 4). Figure 4: Alan mesmerising Tomislav with his modern testing principles (source: Alan Page). Our BossBoss, Richard Bradshaw, also pulled TestBashees in around to the stands on the other half of the UnExpo with his research stand on programming languages (figure 5). 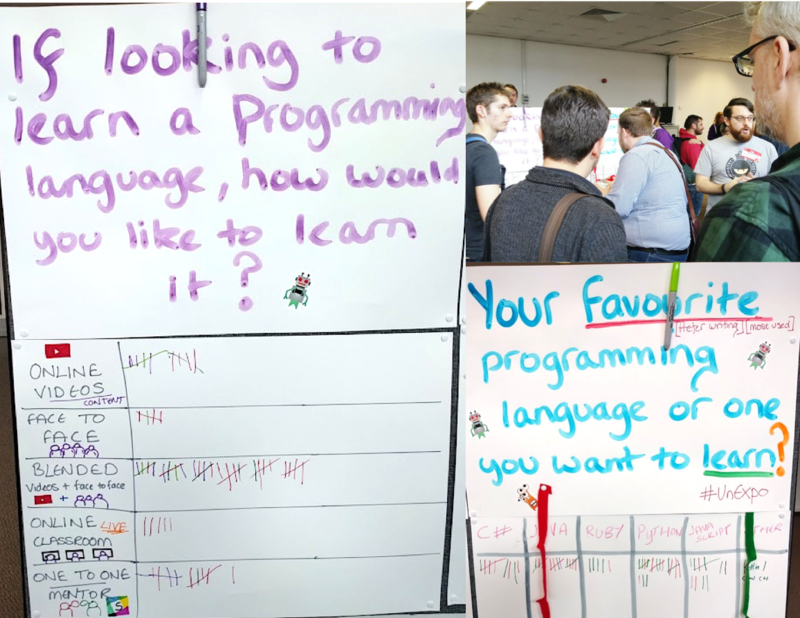 Figure 5: Richard drawing in the crowd with his interactive, crowdsourcing stand on programming languages. A poster stand created by Diana Wendruff on ideal work environments also proved very popular and ran for all 3 sessions of The UnExpo with lots of attendee interaction and engagement throughout (Figure 6). The poster creation station worked well with those running stands able to make their posters prior to their session without disrupting the flow of the current session ( Figure 7). 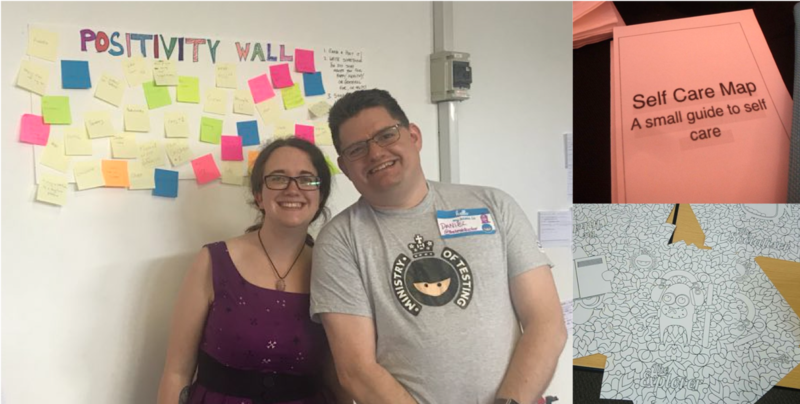 However, it was a logistical pain for TestBash helpers to do the poster swap during the TestBash talks, and it felt a shame to take down the other posters… they were all so awesome! Figure 7: Those running stands getting creative at the creation station. After the first break, The UnExpo was in full swing. TestBash attendees understood the format, knew what to do and embraced the experiment wholeheartedly (Figure 8). Figure 8: The UnExpo vibe was strong. 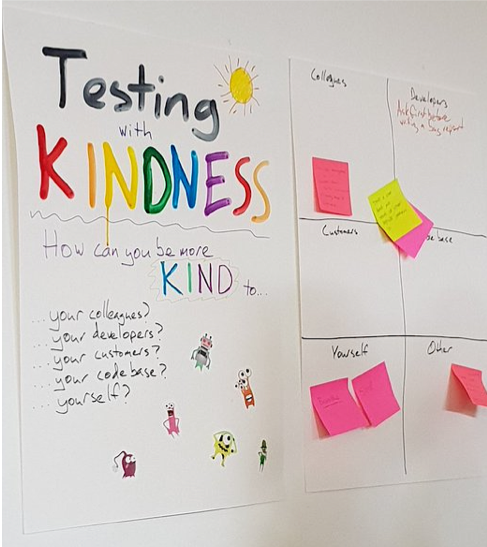 Amber Race initiated the beginnings of the TestBash feels at The UnExpo with her stand on testing with kindness (Figure 9). Figure 9: Amber getting us right in the feels (source: Samantha Flaherty). Then, maximum feels were reached with Dan Billing and Gem Hill’s positivity wall, self care guide and adult colouring sheets (figure 10). Figure 10: Dan and Gem spreading positivity to the testing community (sources: Dan Billing and Guna Petrova). While Abby Bangser was set on continuing the positivity and community connection post TestBash with her stand on testing pen pals (figure 11). Figure 11: Abby created a space and paper slips where TestBashees could reach out and connect with one another after TestBash (source: Abby Bangser). Amazingly, those new to TestBash and even those new to software testing got involved with our experiment and took poster stand slots at The UnExpo. 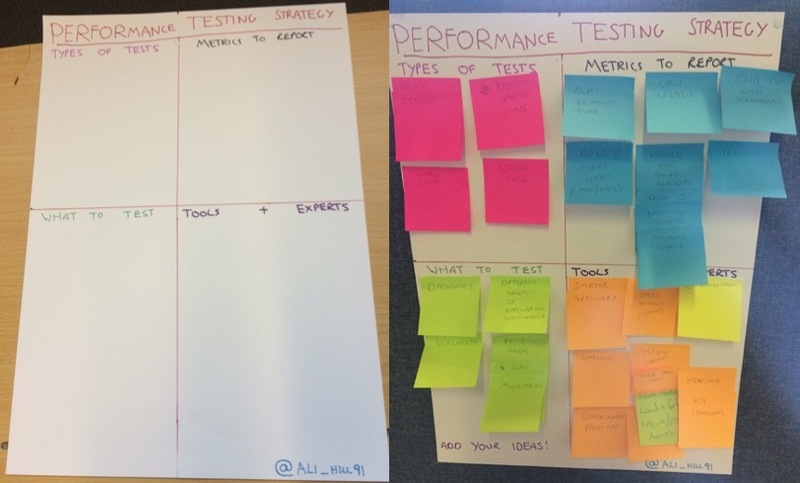 One such example is Ali Hill, who not only blew us away with his 99 Second Talk on not being a super testing hero, he also created a top notch poster that engaged the community to help him co-design a performance testing strategy (Figure 12). Figure 12: Ali Hill collected community thoughts with the aim of co-designing a performance testing strategy (source: Ali Hill). In another example, Leila Gregory (AKA Swanny) used The UnExpo opportunity to try and get her first software testing job (Figure13). Whilst another TestBash newcomer, Jay Harris not only signed up to The UnExpo on the day but enjoyed it so much he chose to run his stand on security testing for a second session (Figure 14). Figure 14: Jay loving talking security with the TestBash community (source: Jay Harris). 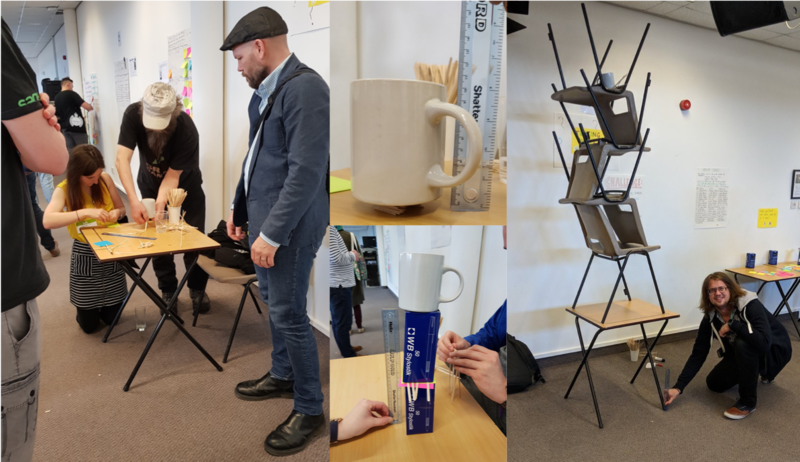 Dan Ashby was not just welcoming TestBashees to The UnExpo, he also set an epically fun challenge of creating a stand for a mug using only 4 coffee stirrers at his stand during lunch and the second break (figure 15). Dan Caseley and Erkki Antonkov put in a joint effort and won the challenge, receiving a Software Testing Clinic mug each. Figure 15: Dan’s coffee stand challenge got the TestBash crowd thinking and experimenting (sources: Abby Bangser, Emma Keaveny and Dan Caseley). 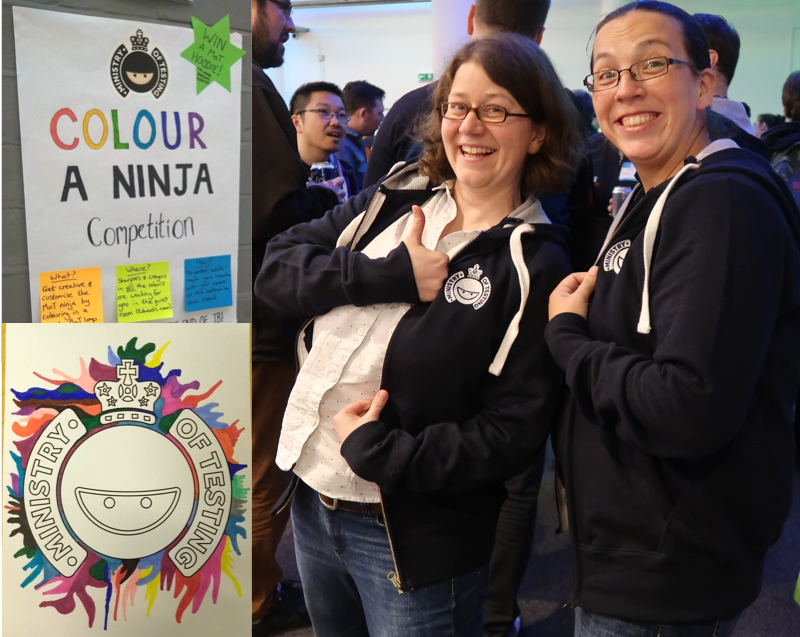 Meanwhile, Karo Stoltzenburg won the equally creative Colour A Ninja Competition and was rewarded with a MoT hoodie (figure 16). Figure 16: Karo winning a highly coveted MoT hoodie from Rosie (source: Karo Stoltzenburg). The UnExpo Was A Hit! We also received some lovely, positive feedback via Twitter (figure 18). Some example positive feedback on The UnExpo (source: Louise Ceridwen, Samantha Cooper and James Sheasby Thomas). And, some constructive feedback from Lee Marshall (figure 19). For me it's yes and no. The idea was great, but because it changed per break, it was difficult to either see it all, or speak with people enough about topics put up. If they were put up and stayed there the whole day, I think it would have been better. Figure 19: Lee giving us his thoughts on The UnExpo experiment (source: Lee Marshall). Lee’s feedback ties in with Samantha Cooper’s experience of only being able to see a third of the room. Furthermore, if posters stayed up through the day it would alleviate the logistical stress of swapping posters for the TestBash helpers. On the other hand, we would not want to lose the awesome stands created by those who were inspired by TestBash and signed up for an UnExpo slot on the day. Our findings support our hypothesis and suggest that poster sessions can engage and encourage software testers to converse with one another. 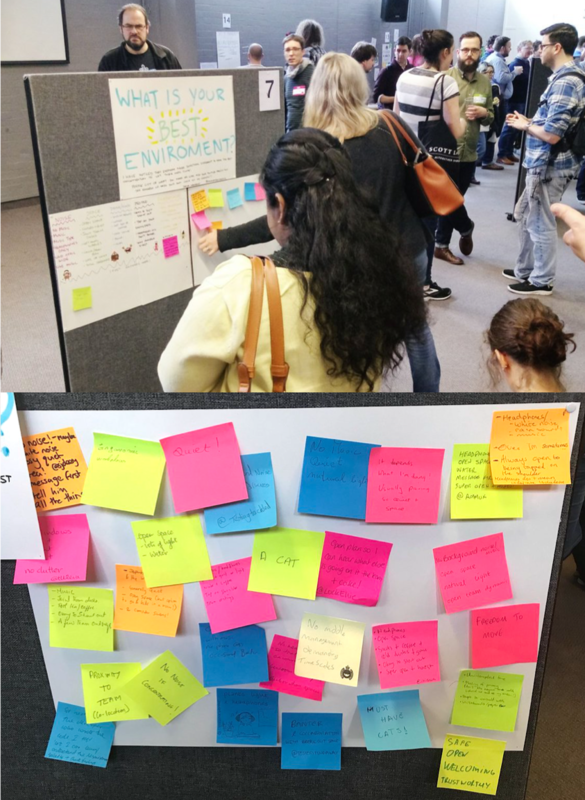 We believe our tweaks to the poster session format led to highly engaging, interactive and fun conference break sessions where testers could have deep discussions around a variety of topics of interests. Perhaps more importantly, maximum feels were reached at The UnExpo and the TestBash community spirit soared throughout. Due to these benefits and the positive feedback from the community, we will be running UnExpos at future TestBashes! At future UnExpos, we will run a more streamlined format with a higher number of stands that will run all day. We will also have a small section of stands that are exclusively for those inspired folk who want to book a slot on the day, these stands will rotate each break. We believe this strategy will allow for attendees to continue conversations but also keep the energy and topics fresh! We will also have less felt, nobody used it… except for BossBoss.